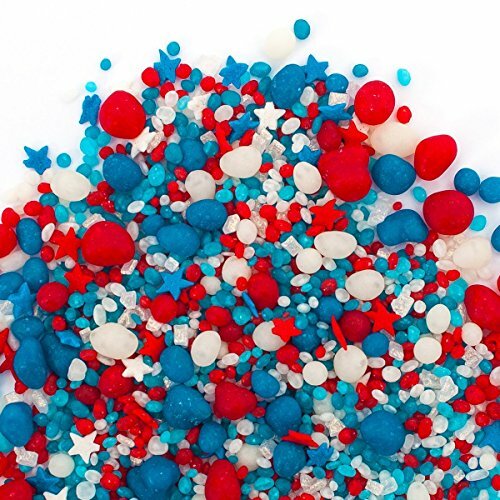 Patriotic Candy Sprinkles | Candyfetti | 8oz Jar | Red White and Blue | Edible Confetti | MADE IN THE USA! by Sweets Indeed at Sunset Succulent Society. Hurry! Limited time offer. Offer valid only while supplies last. Our Patriotic sprinkles aren't just American. They're American with TASTE! That's right, not only are they made in America, but they have taste too. Our Patriotic sprinkles aren't just American. They're American with TASTE! That's right, not only are they made in America, but they have taste too. Each color (red white and blue) of our Patriotic blend has its own flavor; red cherry, white vanilla and blue fruit punch. We're pretty sure you can't get more American with those flavors. Acknowledge all the Patriotic Holidays (Veterans Day, Memorial Day, 4th of July, Flag Day) or celebrate being an American during sporting events like Olympics or other World Sports. Our Patriotic Candyfetti Candy Sprinkles will be a perfect addition and create a tastier atmosphere no matter the occasion. A Sweets Indeed original, Candyfetti is an exclusive blend of flavor packed, chewy candies and sugar shapes designed to enhance your dessert beyond the ordinary sprinkle. Each color is a different, scrumptious flavor and each blend is carefully crafted with complimentary flavors! RED WHITE AND BLUE! Perfect for 4th of July cakes, cupcakes and desserts! Say goodbye to tasteless sprinkle blends! WOW Your Tastebuds! BEAUTIFUL COLORS & FLAVORS! Fruit Punch, Cherry & Vanilla! CELEBRATE AMERICA! Our customers decorate up to 150 CUPCAKES from one jar! Check out all of our candy sprinkle blends! - Search for "Candyfetti"
If you have any questions about this product by Sweets Indeed, contact us by completing and submitting the form below. If you are looking for a specif part number, please include it with your message.